The Chinese fore runner to the Japanese Ninja. Several thousand years older, Shinobi hid within the Chinese Beggar King’s empire, and maintained its position by assassinating enemies of the Beggar King. The vast 20 Million plus Beggar Society within the Chinese Empire was as powerful as the Chinese Government and larger than the Chinese Army. For centuries the Beggar King could call on the Shinobi Assassin to remove his opponents. Shrouded in secrecy Shinobi was only taught to a few. There are no throws, trips, takedowns, armlock/wristlocks as in Ninjitsu. The Shinobi agent did not Spy or gather Information. Therefore he had only one purpose..
Shinobi came to Ireland in the early sixties and was taught to a selected few by Master Fanning since 1972. Furthermore students were chosen and could not apply to learn this system, it also uses extreme finger strength which is tested every week to break Wood, Tiles, stone and Brick/Block, with fingers or Thumb. Shinobi classes available under the guidance of Frank and Bren, call (086) 1679009 for more info. Master J.Fanning had the Shinobi book of Grades and Enrollment dating from 1916, if you wish to confirm your Shinobi Teachers grade qualifications, please contact us . 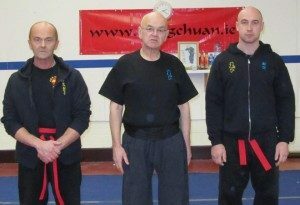 Classes in balbriggan – this is the first Shinobi course open to the public – previously only students were invited.